Can you share the recipe? thought of baking one this weekend. Also would be grateful if you can provide tips on how to convert it into a orange chiffon cake. 1. Sieve flour and baking powder. 2. Use hand whisk to whisk egg yolk until creamy and light in colour. 3. Add in flour mixture into yolk mixture lightly. Add in orange zest. 4. Beat egg white with electric beater until big bubbles formed. Sprinkle in cream of tartar and beat until it is white in colour. formed. About 8 - 10 minutes for 150w egg beater. 5. Pour 1/2 egg white into flour mixture in (3) and blend well. 6. Pour flour mixture into the rest of the egg white and blend well. 7. Bake at 175C for 45 minutes or until cooked. 8. Invert the cooked cake during cooling process. This is the best Orange Chiffon I've tasted so far and hope you will like it too! If you do bake one, please post your comments OK! 1. Can I use fresh OJ from the fridge? 2. Can I substitute something else for cake flour? Eg. sifted plain flour? 3. Total sugar = 150 g? Or mix 50 g sugar into egg white mixture over 3 times? 4. Do we mix steps 5 and 6 before baking? 1. You mean cold OJ, no should warm it. Effect on yolk. 2. Plain flour - remove 2 tbsp and replace with 2 tbsp corn starch. Wow...u r a professional baker? Jus saw yr photos, all the cakes look so yummy. Please share more of yr cake recipe. 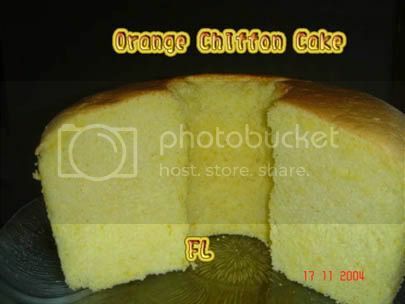 I am keen to try this orange chiffon but i do not have the chiffon cake tin. Can i use a normal cake tin? Novice speaking here, but I read from another website that you can use a normal tin, but you have to find a way to invert the cake (while in the tin) while its cooling, cos it will have an effect on how the cake sets. Another consideration is the height of the completed cake. Not sure if a normal cake tin will be high enough for chiffon cake? I used a 18cm Chiffon Pan, if u don't have one, you can use a 20cm round pan so that width of the round cake pan will contain the height of the chiffon pan. Please try this cake, it is really very very nice and light. Remember to whip the egg white until stiff perks formed as the egg white is the support for this cake. One more Q, I went to supermart just now and was stumbled when buying orange juice cos there is two type, one with pulp and the other without. Which one should i buy? I will go to PH to buy the tin. But first like to check with u, the chiffon tin is the one that the base can be remove and has a centre piece, right? I saw metro selling the chiffon tin with the centre piece but base not removable, can this be use? Sori to trouble u with so many questions. Either kind of OJ will do. I used 100% OJ with pulp. only have 'My cake". Can u link me to it. Btw yr yahoo photo is in Chinese right? I buy everything already. Ready to bake. Tomorrow i will try then let u know. Where did u get the cake container from, in HongKong or Singapore? I am trying to find one high enough cos my tupperware container is a bit too shallow. Got it as a gift from a friend who was in Perth during the summer holidays. The brand is DECOR. If you can find DECOR storage products they might have it. My orange chiffon cake. It really so.... soft, not too sweet and a beautiful light orange colour. Yumm. Wow! Good work. Did u like it? Taste better than the ones you buy from store right. The sweetness is just right because I have adjusted the sugar level after a few tries. Is it all gone yet? When I baked this cake the last time my sister was in HK, she ate half of it. She said the cake is so light and fluffy that it feels like eating wind. Tips: To get rid of big bubbles in the cake batter, bang the ready to bake batter 3 times while in the cake pan. After the cake is cooked, remove it from the oven and give it 1 big bang before you invert it to cool. Definitely better than from the store. I always find store bought one the texture a bit rough and way too sweet. Its all gone in a jiffy. Its so easy to eat and u just cant stop. Yr sis description is so correct. My dh n ds love it. This is definitely going to be my 'always' bake list. Thanks for the tip, I am gg to bake another one for my mum this Thursday. i just tried this recipe. the texture is FABULOUS!!! however, it tasted a little too bland, maybe because i miss out the orange rinds. i'm too lazy to get the oranges. can i use freshly squeezed OJ instead? Can I use orange cordial like F&N orange squash instead of orange juice ? If so, do you think I should reduce the sugar a little bit ? Bland? How about sweetness? If you don't add the orange zest you should increase the sugar level. Yes, you can use freshly squeezed OJ, but mind you, freshly squeezed OJ might be sour unless you have really sweet oranges. For convenience it's better to use 100% OJ from the pack. I like those with pulp. I do not suggest using cordial 'cos chemical reaction might occur when put to the heat test. As cordial is not 100% natural. Just go and get a pack of 100% OJ which is so convenient, and don't forget to add grated zest of 1 orange otherwise, your orange chiffon cake will not taste good! my mom tasted a bit on the salty side. i guess i will increase the sugar in the yolks (am i right? not the whites?) i really need to get a few good juicy and sweet oranges. and not forgetting the orange zest. how do u invert the cake? do u invert it on a cooling rack? What kind of cake pan are u using? 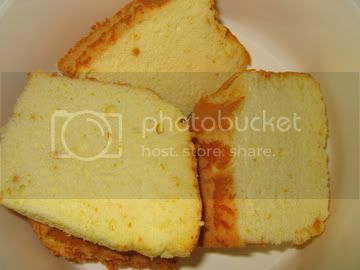 Mine is the 3 legged chiffon pan as in the photo in my link(pls check previous posts). If your chiffon tube pan is not 3 legged then invert it over a bottle else what can you do but just invert it on a cooling rack. last night bake another one with squeezed OJ and zest from one orange. the outcome was delicious!!! Florence, thank you very much for such a great chiffon recipe!